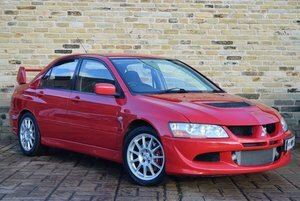 Here we are very pleased to offer, what is quite possibly the best Mitsubishi Lancer Evolution VI RS available in the world. A very strong statement indeed – but we are confident that an equivalent is unlikely to exist. 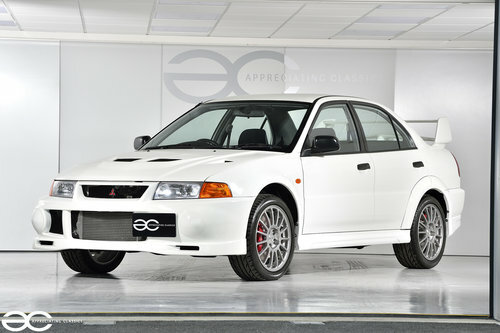 We are familiar with special Mitsubishi Evolution’s, having personally owned show winning examples ourselves, so rest assured, when we say this car is superb, we mean it. The RS variant is regarded the ‘best of the best’ variant, being the lightweight version. Not only were they very light in weight, but they also had other upgrades from factory, such as a close ratio gearbox, quick steering rack and a limited slip differential, to name just a few. 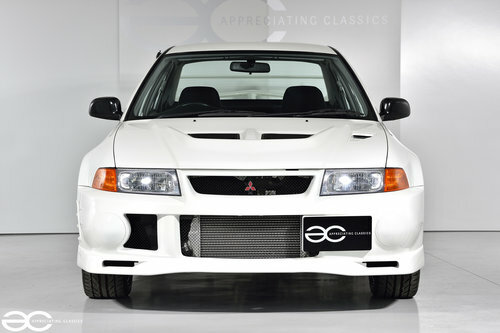 It is also the last Evo model to win a world rally championship! A truly remarkable example, of a cult classic, limited production vehicle with racing heritage. With the RS being the lightweight variant (weighing only 1260kg’s! ), a rear limited slip differential and no AYC, a ‘quick steering rack’, short ratio 5 speed gearbox, and a titanium turbo impeller, the RS made for a superb machine from the off. 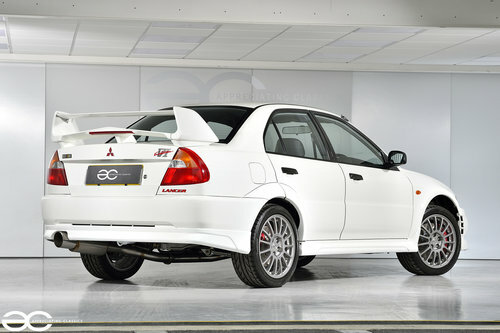 Most of the RS models naturally became the basis for fully fledged rally cars, and with only 726 being produced, it is a very rare car today, not only in this condition, but also in road/factory trim. This particular example was imported in to the UK from new in 1999. The first registered keeper, Lifton Bridge Car sales owned the vehicle from 1999 until 2002. The second owner cherished the car from 2002 until 2004. In 2004, a Mr Swindell purchased the car and it was within the ownership of Mr Swindell that the car had over £13,000.00 lavished on the underside to achieve Concours standards, with many new genuine parts replacing good condition parts, and the work was carried out by well renowned concours specialist – Moorland Classic Cars. (receipts present for works carried out & parts purchased). The car had always been a dry weather road car only, but Mr Swindell wanted to ensure that this example was ‘the best of the best’. In 2013 Mr Swindell sold the car to the current registered keeper. The paperwork file is vast, with lots of invoices, service receipts, sorn declarations and tax discs present. With mileage on the last three services being at 11,970 miles, this is due to the car not being driven, being stored in an air chamber and being transported via enclosed trailer for servicing. 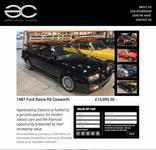 As you would fully expect, the bodywork of this vehicle is immaculate throughout. You would be very hard pushed to find fault, other than maybe a couple of very small of stonechips. Within the paperwork file are receipts for professional detailing during the cars later life, demonstrating that the car really has been cherished over the years. Of course, the correct RS black handles and mirrors are still in place, along with the RS fog light covers and original badges. All glass is without any damage, and the lights are in superb condition. 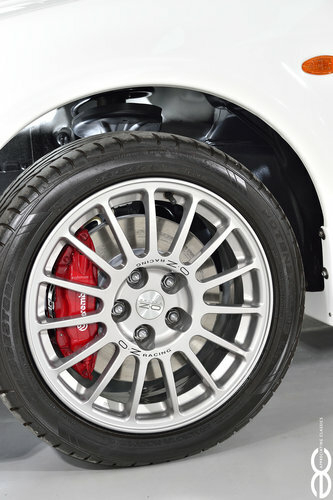 Fitted with the optional 17&#8243; OZ Racing alloy wheels from new, which are also in unmarked condition of course. The underside of the car is simply beautiful, finished to an extremely high standard, it would look perfectly at place within a collection, or on display at any car show. The RS interior is exactly as it came, and simply in ‘as new’ condition throughout. Anybody not familiar with the RS variant, will notice that the RS has many differences inside, when compared to the like of the GSR, TME or RS2 etc…. The non airbag steering wheel is without any signs of wear, as are the RS seats. An absence of a stereo, climate control, and electric windows hint at the Motorsport pedigree of the RS to all comers, and so it should do, with the car only weighing 1260kg! Whilst very basically equipped, the RS interior manages to be very aesthetically pleasing, and is a true rarity to see in such condition and with zero modifications having been carried out. The superb 4G63 engine…… what a great engine! This example, of course runs beautifully. None of the usual tapping lifters/lashers as is so often the case with these engines, the engine runs very quietly even from a cold start. Likewise, it remains quiet even when hot. 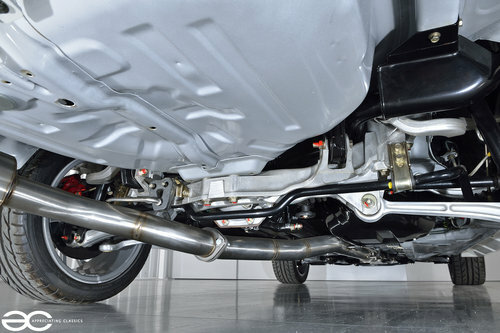 The car is without any modifications, other than a full 3&#8243; stainless steel exhaust, and this was done so the car could be ran to temperature regularly whilst in storage, without the fear of corroding the exhaust from the inside out. As can be seen from the pictures, the engine bay itself is absolutely stunning, and as per factory. All of the original zinc plated parts still look superb, and it is without any of the common corrosion issues along the chassis seams. With the bonnet up and the engine on display, it draws many positive and complimentary comments regarding the beautiful condition. As previously mentioned within the listing, the underside has been prepared to concours standards, this obviously includes all running gear. Receipts are present for many new old stock items, and everything that has been re-finished whilst undergoing the works, has been done to fully replicate the original finish. This includes paint colours and finishes, PDI markings, zinc plating and so on. Of course, the car is without any unwanted noises, and the clutch/gearbox are a total pleasure to operate – still being nice and tight as it should be. The wheels are unmarked, as are the Brembo brake calipers (which were optioned when new), and the disc centres are as new.